I finally visited Banapple bakery-café one weekday since I've been hearing so many people gush about their food. My best friend lives in a village in Katipunan very near Banapple, so I've been passing by it several times whenever I visit her place. And as I am a person who will never back out of good eats, it was time for me to try it out for lunch. Personally attending to my order was GJ Jimenez, the other half of the husband-wife tandem responsible for bringing to life Banapple and bringing in sugary calories for food lovers to indulge. "My wife Maricel loves to bake, and I handle the marketing and business side of Banapple," he says. The bakery-café got its quirky name from its bestselling desserts--the famous and incomparable Banoffee Pie and the Apple Caramel Crumble. 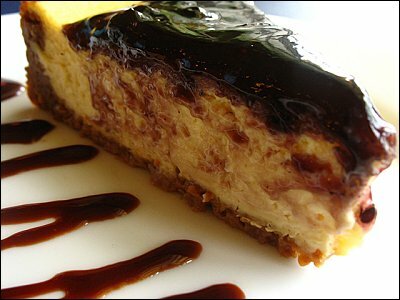 Banapple started baking pies and cheesecakes in 2000, initially supplying to friends and family. In a couple of years, they expanded and started supplying to cafés. The place itself is small and has a certain charm to it, the way homes radiate a welcoming, warm atmosphere to its guests. Banapple's interiors are very warm and inviting, with touches of country-style in their decor. 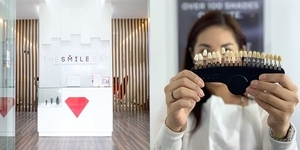 From students of the nearby schools along Katipunan, to the office crowd, and to weekend family gatherings, Banapple has gained an impressive number of loyal customers ever since it opened doors to the public last March. It has become a pleasant landmark, and commuters stop for a quick take-out to and from work and school. Banapple is open as early as 7:30 for hearty breakfasts and closes at around midnight, perfect for after-dinner coffee and dessert. Before devouring their best-selling pies, I first had to fill myself up with lunch. Along with my friend Phil who was willing to share some calories with me, we tried out a couple--nay, several--items on their menu. Well, make that six items. 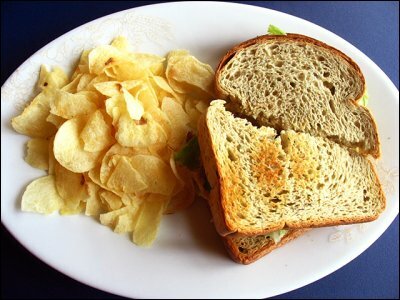 The Terrific Tuna Sandwich (P85) is served on wheat bread and with potato chips. The tuna salad was creamy, and topped with cheese, lettuce, and a. special dressing. It's not really rocket science to be able to prepare a good tuna sandwich, but I do like the fact that they do not scrimp on the tuna salad, because some establishments overkill on the mayonnaise and leave you wondering if there is actual tuna on the spread. 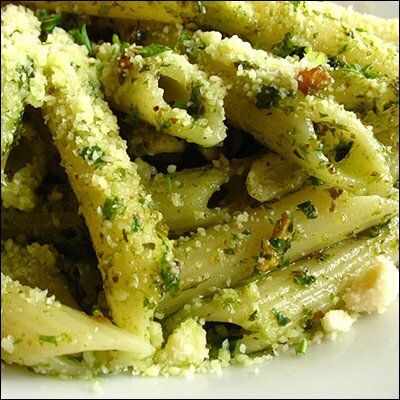 Their Pasta Verde (P110) is a blend of chopped basil, olive oil, and pecans, served with penne. 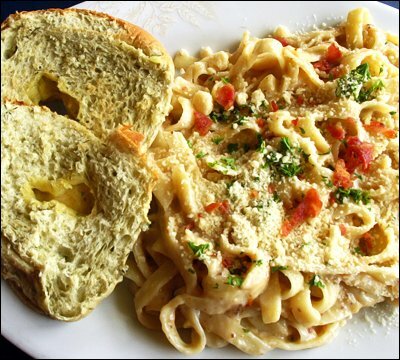 The pasta is perfectly al dente, and all pastas in their menu are served with pesto butter bread. The Fettuccine Jacintha (P110) on the other hand is Banapple's version take of the classic carbonara, adding special herbs. We also tried out two entrees, both served with garlic rice and a siding of buttered carrots. 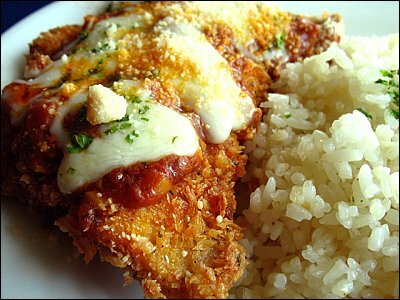 The Chicken Breast Parmigiano (P145) is a platter of tender fillets of chicken breast, encrusted in a parmesan crumb mixture. 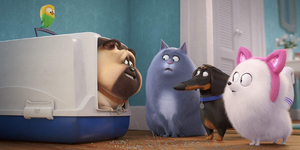 The chicken is topped with stewed tomato sauce and mozzarella cubes. 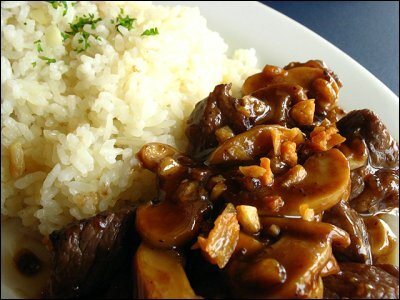 The Salpicao Rafael (P150), cubes of rib-eye steak and sliced mushrooms, is smothered in garlic pieces and seasoned with special brown sauce. 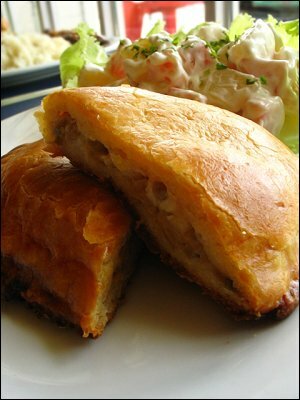 Banapple's Creamy Chicken Pie (P75) is served with chunky potato salad (the pie is P40 without the side salad). The pie has moist chicken flakes inside, blended in creamy white sauce. The pie's crust is oh so delicious - very flavorful and buttery. All items served that afternoon appealed to my gustatory sense, but I do like to play favorites. I highly recommend for you to try out the soft, buttery chicken pie and the very flavorful parmigiano--they are now in my list of all-time favorites! After a hefty lunch, we were served our desserts--yes, in plural form once more. All of Banapple's pies and cheesecakes are original, handmade, and baked fresh daily. 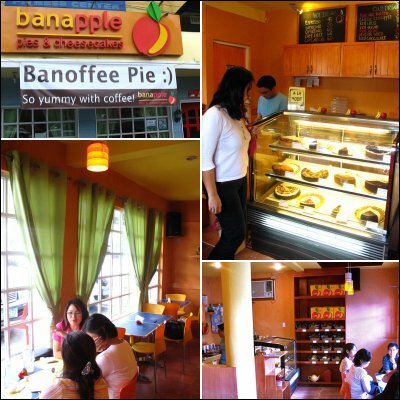 Aside from pies and cheesecakes, Banapple offers freshly baked breads, cookies and muffins. As GJ serves to us our pies, we dig in. Of course, whenever dessert arrives, I immediately forget that I am full. Dessert does that to you. I am a fan of their Blueberry Cheesecake (P75 slice/P700 whole), as, for one, they do not use gelatin, and secondly, they offer a creamy and rich kind of cheesecake that doesn't smother or overwhelm your tastebuds. I personally think their cheesecakes are much better than other cheesecake specialty stores. Next in line was the Super Caramel Fudge Cake (P75 slice/P700 whole). I grab my fork again and slice myself a small piece to try. Once the cake entered my mouth, I realized why it's called "super"--it will literally surprise you because it is the most sinful thing ever! 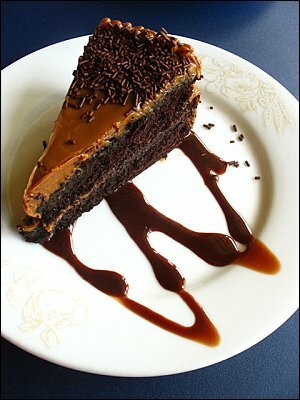 This is definitely for the sugar-loving individual as the chocolate and caramel combination can be quite devilish. 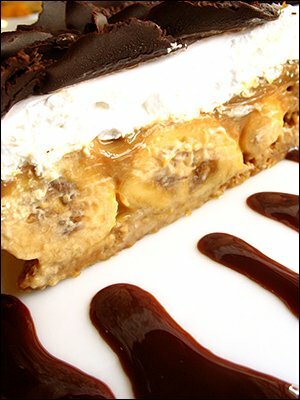 The last pie on our dessert list is their most famous one - the Banoffee Pie (P65 slice/P480 whole). 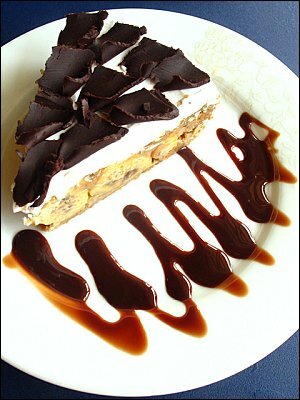 Now, even before visitng Banapple, I have been daydreaming about its taste, as I have been hearing raves about this pie. I have put the Banoffee pie on a pedestal, and now it's time to experience it for myself. The verdict? This pie is divine. Never mind if I don't really know how to pronounce it. Never mind if I had eaten too much for lunch already. The Banoffee pie has met my standards and I urge you to try it out for yourself to taste a slice (or even more!). The pie has chunks of sweet bananas, and holding them together is rich and sweet dulce de leche. The caramel is just utterly delicious. More sweetness is added to the pie with a whipped cream top, decorated with chocolate shavings. The graham cracker base perfectly holds the pie together. Banapple has certainly gained a loyal customer in me as both my craving for hearty meals and mouth-watering desserts were truly filled and fulfilled. Looking for pies, cheesecakes, and a whole lot more? Go bananas over Banapple!